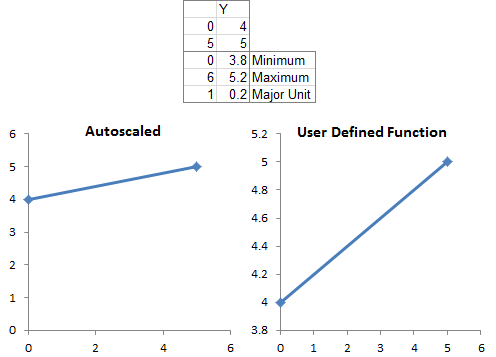 In a recent post I described how How Excel Calculates Automatic Chart Axis Limits. The problem with these automatic limits is that they often leave a little too much white space around the outside of the plotted data, especially between the lowest data point and zero. But it’s tedious to guess at your own axis scale, and it would be nice to calculate your own limits in your latest and greatest VBA charting code. This article presents code that takes high and low series values and computes “nice” axis scaling parameters. The code can be called by other VBA procedures, or it can be used in the worksheet as a user defined function (UDF). I started with code from a November 2001 newsgroup post by Stephen Bullen. I modified it slightly, and corrected a minor algebraic error. 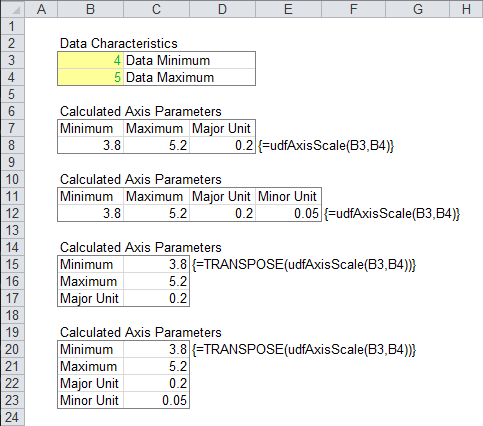 The following is an entire module, including a user defined variable type (scaleAxisScale) to contain the axis scaling parameters, the main function procedure that does all of the work (fnAxisScale), and a small function procedure that is the UDF interface with the worksheet (udfAxisScale). 'What if they are both 0? The procedure returns a four-element horizontal array. In its simplest implementation, select a horizontal range of four cells (or three cells if you don’t care about the minor unit), type the following formula into the formula bar (min and max can be cell references, constants, or formulas), and hold Ctrl+Shift while pressing Enter to create an array formula. Don’t type the curly brackets; Excel does that if the array formula is valid. To enter the axis scale parameters into a vertical range of cells, select the range of three or four cells, enter the following formula (without the curly braces) into the formula bar, and hold Ctrl+Shift while pressing Enter to create an array formula. The following screen shot shows this in action. The min and max for an unseen axis are entered into B3 and B4. A three member horizontal array of axis min, axis max, and major unit is entered in B8:D8 using the formula shown in E8. A four member array including minor unit is entered in B12:E12 using the formula shown in F12 (it’s the same formula used in the three member array). A three member vertical array of axis min, axis max, and major unit is entered in C15:C17 using the formula shown in D15. A four member array including minor unit is entered in C20:C23 using the formula shown in D20 (it’s the same formula used in the three member array). The following further illustrates the UDF. The cells in the upper three outlined rows contain X values (0 and 5 in the first column) and Y values (4 and 5 in the second column), which are plotted in both charts. 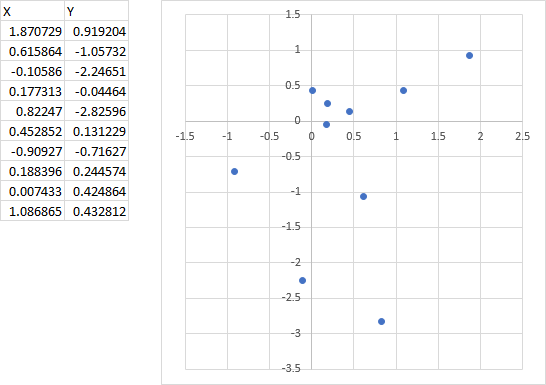 The cells in the lower three outlined rows contain calculated values for minimum, maximum, and major unit for the X axis (first column) and Y axis (second column). 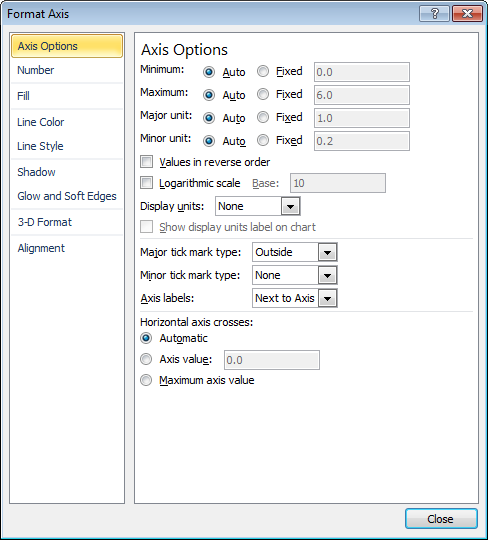 The axis parameters are manually changed from the left chart’s automatic values. 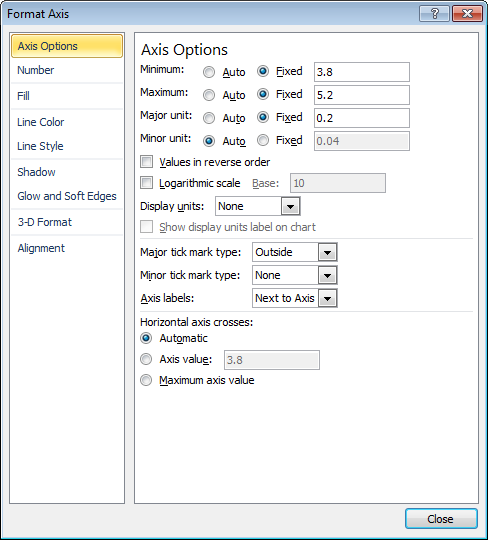 . .
to the right chart’s calculated values, by entering the new values into the Format Axis dialog. The following procedure takes an XY chart, finds the min and max of all series plotted in the chart, passes these to fnAxisScale above, then applies the calculated scale parameters to the chart. If the chart is not an XY chart, the X axis cannot be rescaled in this way, so the code must be modified. The ScaleChartAxes procedure above can be called in several ways by the following procedures. Each one is run by the user, and passes one or more charts into ScaleChartAxes for rescaling. This procedure rescales the active chart. This procedure rescales all charts on the active sheet. This procedure rescales all charts that have been selected (using Shift or Ctrl to select multiple charts). Posted: Friday, March 9th, 2012 under Chart Axes. I put a couple of formulas on my model and this keeps the date scaling for the horizontal bars in line with the xy scale. On Error Resume Next ' too lazy to have better error handling. Maybe some of you readers can leverage. The ideal solution to the chart formatting issues would be to define a new Chart class. Then you could loop through all the charts in the worksheet, processing all the scales, formatting and colours along the way using custom functions like this. Frankly though, that’s a large project and bespoke to how you want to do things. For me, it’s mostly a case of keeping consistant colours across everything so that for instance the same countries in Europe are coloured the same across all charts; alternatively another formatting issue I deal with is pie chart label positioning. Now I’m adding scale stuff like this and I’m tempted to spend a day or two building up that new chart class. I don’t think you need to create a special class for the charts. There already are the Chart and ChartObject classes, with all of these properties. I make use of these when I use “For Each cht In ActiveSheet.ChartObjects”. To keep your countries the right color, you could use a technique like I described in VBA Conditional Formatting of Charts by Category Label, updated for the Excel 2007 color model. Almost identical to my implementation, I use a hidden “Palette” tab. I know about the chart/object classes but my point was to create a class with a similar set of paramaters as found in the chart class, but fixed. For instance if the scales were “auto”, they would actually be switched to manual and set using the ideas you’ve been looking at or set to a range on the sheet. Similarly the scaling, formatting, fonts and label positions/sizes would be sorted. I was wondering if there is a way to specify the number of tick labels required when calculating the scaling parameters? When constructing panel charts I usually like to limit the number of tick labels. Changing dScale will have an effect on dMin and dMax. Experiment to find settings that work for your particular chart. Thanks Jon – I’ll give it a try. I’m trying to use your code to do some auto-scaling for some column line graphs. I graphing last twelve months of sales in columns and the margin as lines. Sales are on the primary axis and margin is on the secondary axis. I removed all of the x scale code. Now I’m trying to determine what I need to change to pick up the secondary axis. The code is applying same values for the secondary axis. Any feedback would be appreciated. You have to keep your calculations straight, so you use the appropriate values to compute the primary and secondary axis scales. In my code, .Axes(xlValue) is shorthand for .Axes(xlValue, xlPrimary) and references the primary Y axis. The secondary Y axis is .Axes(xlValue, xlSecondary). Hi Jon, in line with Jason’s comments, I am trying to scale a line chart that has 3 series on the primary axis and one on the secondary axis. The problem I am running across is that the .SeriesCollection.Count returns 4 so the min/max is the combination of all 4 series. How do I “filter” the .SeriesCollection.Count to only loop through the 3 series on xlPrimary separate from the 1 series on xlSecondary? Check the .AxisGroup property of each series. If it is 1 (xlPrimary), include its data in the analysis; if it is 2 (xlSecondary), skip it. Andrew, I am going to try posting my revisions to Jon’s code again and hope the website like it better this time. If this works, you should be able to apply this directly for your use. I also boiled the subroutines that call this code down to two – ScaleActiveSheetCharts & ScaleActiveChart – and embedded them below but you can obviously call it however you need. To explain, I have a worksheet which has stock price data from every day over a number of years and I select a date range depending on the period I wish to view on a chart. Further I wish to have the date scale set by VBA to Major Ticks of 1 month for periods longer than 6 months, and to 7 days for periods less than six months. I worked out the 7 days for major ticks, that was easy as the charts xlCategory appears to default to days when set by VBA. How can I set the major tick properties in VBA to 1 month. Here’s how to set the axis major tick spacing to 7 days, 1 month, and one year, and then reset it to automatic. Thank Jon, that’s exactly what I needed. You can cycle through the series in the chart to determine if a series is in the primary or secondary axis group. This way you can determine min and max for each axis. Then you simply apply primary axis scale limits to the primary axis, and same for the secondary. My application of this needs to handle both positive and negative values. 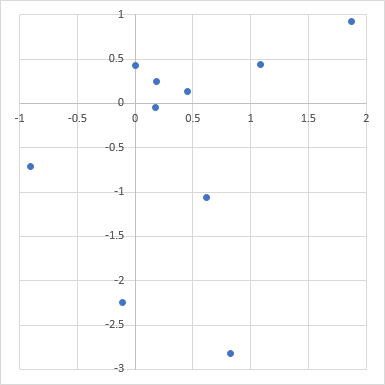 In short, I’m creating a sort-of Cartesian coordinate system X-Y graph that plots a circle based on user data that represents a ‘boundary’ condition. It then calculates and plots a single point based on other data, and the chart graphically shows the user whether their point is good or bad based on whether it plots inside the circle. But since the boundary circle center works as (0,0) coordinate, the user’s input could be +X or -X, and +Y or -Y. Is there a way to modify the code to handle this? Did you try it? I just generated some random XY data with data in all four quadrants, and the code as presented in this article calculated appropriate min and max scales which were “nicer” than Excel’s defaults.